The next big US mission to Mars was very ambitious and very successful. Launched in 1975, Vikings 1 and 2 each consisted of an orbiter and a lander – and everything worked as planned. Scientists had hoped the landers would be able to detect signs of life. Alas, they struck out on that front. 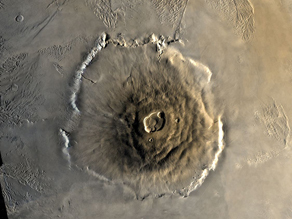 This image shows the highest peak on Mars – the Olympus Mons – a dormant volcano that is three times taller than Everest and covers an area the size of Arizona.